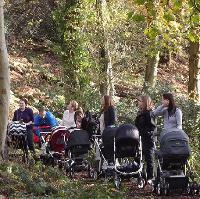 Join us for a brisk 1 hour walk around the reserve on pram friendly paths. A great way to get out in the fresh air, get some exercise and improve your own health, as well as meet and chat with other new parents and carers. You are then welcome to join walkers for a coffee in our restaurant after the walk. Not just for Mums!! - Dad's, Grandparents and other carers are all welcome! This walk is not suitable for children who want to walk alongside their parents/carers. This so that we can walk at a brisk pace, and you can get some exercise! If you have children who want to walk along with you, our Toddle Together on the first Thursday of every month may be for you. Car parking charges apply. 3, 6 and 12 month Visitor Passes are available to purchase.